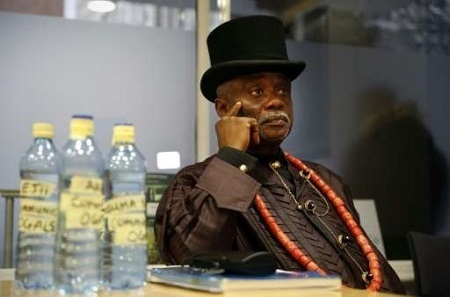 King Emere Godwin Bebe Okpabi holds up a plastic bottle containing contaminated water from his community in Nigeria, proof of oil pollution that he blames on Royal Dutch Shell—and on which he hopes a London court will deliver justice. My people are drinking this water, said the tribal king of the Ogale community in the oil-rich Niger Delta. There are strange diseases in my community—skin diseases, people are dying sudden deaths, some people are impotent, low sperm count, he told AFP. I can afford to buy water. But can I afford to buy for everybody? No. But Okpabi, wearing a traditional robe with a red necklace and black top hat, said the English justice system was his only hope to end the blight on his people`s lives. Shell is Nigeria and Nigeria is Shell. You can never, never defeat Shell in a Nigerian court. The truth is that the Nigerian legal system is corrupt, he said. It should order the company to go and clean-up Ogale, go and provide water for them; go and do medical history for them, and where medical attention is needed provide for them, he said. The king said no money would be enough to address the damage, which UNEP warned could take 25 to 30 years to resolve, but wants compensation, adding: We are dying. Both Bille and Ogale are areas heavily impacted by crude oil theft, pipeline sabotage and illegal refining which remain the main sources of pollution across the Niger Delta, a company spokeswoman said. But Okpabi and his lawyers say the company`s ageing, leaky pipelines still run through the region and it must take responsibility. Okpabi said he believed President Muhammadu Buhari is sincere in wanting to address the issue, but warned: If we wait for the system to roll on its own, I hate to say this, but it may be too late for the people of Ogale. Attacks on Nigerian pipelines have increased this year, cutting output and helping tip the country into recession, but Okpabi insists there is no vandalising in Ogale. The king condemned the saboteurs, warning that you cannot bomb your house to get attention. However, he added: I`m also appealing to Shell and the Nigerian government to listen to those communities that are non-violent and do something. Photo: King Emere Godwin Bebe Okpabi sits next to plastic bottles containing contaminated water from his community in Nigeria, proof, he says, of oil pollution by Royal Dutch Shell. Source: Phys.org.